Neighbor draining onto / flooding my patio and yard daily - what can I do? I have a neighbor who runs his sprinklers every morning, rain or shine. His yard slopes gently down to the fence between our yards. Every morning, the water floods under the fence, across my patio, and leaves an inch or two of standing water on my patio up against my detached garage. I have spoken with him a number of times over the last couple of years. It's obvious that he believes this is my problem, and not his at all, despite my insistence that it is against code to drain onto neighboring properties. He refuses to care or do anything about it. I'm at my wits end. It is ruining my patio, and potentially rotting out the base walls of my detached garage. The patio is cracked substantially at this point, and I can't tell if water is going underneath the concrete and coming up in the cracks, or if it just goes down into the cracks and "squishes" up when I step on it. It floods my grass up to 10 feet into my yard. My kids can't use the play equipment because it's soggy / muddy around it all the time. Mowing the grass is a problem for the same reason. On the bright side, I have capped my sprinklers and don't water at all in that area. What can I do? My wife and I want to be polite, and we are both very non-confrontational in general. The neighbor is going through cancer treatments and has recently lost his job. Should I tear out the concrete and build a curb / gutter type of retaining mechanism? Should I bring in a dump-truck and dump a couple of feet of dirt up against the fence? I don't want to get lawyers involved, but I'm at my wits end with this (and the other issues you've helped me with recently). What would you do? Last edited by Elemental on Fri May 19, 2017 10:40 am, edited 2 times in total. What happens when it rains, absent your neighbor's sprinkler(s)? Why not a small ditch along your property line to get that water to some place that you need it? Or it could be just in front of patio so that your lawn is watered for free by the neighbor. This could be elaborate like a French drain ... or not. You could even have a diverter to send it back where it came from. When you say it is against code, do you mean it is against city code? If it is, your city should have a code enforcement department. You could regrade your yard to protect your patio and garage. This is the route I would probably go. See if you can direct his water in a way that is beneficial to you to offset the cost of the project. It sounds like you have a drainage problem that you need to fix. Surely a person has a right to water their lawn. I have a similar issue that is partly caused by construction my former neighbor did before selling. Unfortunately, I'm going to have to do the fixing. I should have hired a landscaper to inspect the work the neighbor's guys did. I don't know who created the situation, but if it is somehow your neighbor's fault a professional will be able to tell you. Get one and see what he says. psteinx wrote: What happens when it rains, absent your neighbor's sprinkler(s)? I admit, when it rains, it does collect into a pool against the garage. I know that's my problem, but not sure how to fix it. The garage is built on the concrete. livesoft wrote: Why not a small ditch along your property line to get that water to some place that you need it? Or it could be just in front of patio so that your lawn is watered for free by the neighbor. This could be elaborate like a French drain ... or not. You could even have a diverter to send it back where it came from. My concrete goes right up to the fence line, so I would need to cut out and remove some concrete for a ditch. How wide would you guess it should be? Would the ditch need to be lined with plastic or something to prevent it from going under the concrete? The problem would be there when it rains regardless if sprinklers. Sounds like the neighbor wouldn't have the money to pay to fix the problem, even if you sued him and won. So you have 2 options, pay for a lawyer, get a judgement he can't pay so you get a lien on his house so you get paid when he dies and the house is sold. Or install a drainage system now to prevent huge bills down the road when your garage falls down. Drainage ditches have to be designed to divert the water away from areas where it causes damage. You might want to consult an expert. Here is an example of a French drain system. Last edited by mhalley on Thu May 18, 2017 2:57 pm, edited 2 times in total. mhc wrote: When you say it is against code, do you mean it is against city code? If it is, your city should have a code enforcement department. Yes, it is against the city code. I'm hesitant to call code enforcement, but maybe I should. The concrete goes right up to the fence line, so I would need to cut out the concrete and then I guess bring in dirt to slope it back towards the fence? I guess we'd still have a puddle there, but it wouldn't be right next to the garage. The garage is probably 5 feet from the fence with concrete extending to the fence line. More likely it would be a concrete gutter to take the water somewhere else. Google "French Drain". I've seen them only 1 inch wide. Elemental wrote: I admit, when it rains, it does collect into a pool against the garage. I know that's my problem, but not sure how to fix it. The garage is built on the concrete. I think at a minimum, you need to fix your situation to the point where rainwater (both what falls conventionally on your concrete area, and what drains from the natural slope of your neighbor's yard) does not present a problem, before you pursue your neighbor too vigorously over the sprinkler issue. As to how to solve this? Dunno. Outside of my expertise. Around here, there is at least one company that advertises for foundation water issues. Your issue is perhaps a bit different - the foundation may be fine but the surrounding stuff problematic. Still, I suspect a good starting point, after some internet research, might be a company that specializes in drainage issues. mhalley wrote: The problem would be there when it rains regardless if sorinklers. Sounds like the neighbor wouldn't have the money to pay to fix the problem, even if you sued him and won. Or install a drainage system now to prevent hushed bills down the road when your garage falls down. I think you're right. What kind of specialist (or search terms) should I be looking for for a drainage system? I think "landscapers" are mostly sprinkler and lawn care around here. Elemental wrote: Yes, it is against the city code. I'm hesitant to call code enforcement, but maybe I should. The concrete goes right up to the fence line, so I would need to cut out the concrete and then I guess bring in dirt to slope it back towards the fence? I guess we'd still have a puddle there, but it wouldn't be right next to the garage. The garage is probably 5 feet from the fence with concrete extending to the fence line. It appears they're only in certain parts of the Midwest. But if you're not in this area, perhaps there's a similar company in your area? bottlecap wrote: It sounds like you have a drainage problem that you need to fix. Surely a person has a right to water their lawn. Surely he has a right, but watering every day is one of the dumber things he can do to his lawn. If your lawn is healthy you shouldn't have to water more than once per week, and that's assuming it hasn't rained at all. Overwatering just causes you to have to water more often. He's literally wasting his money. May as well just turn the faucet on before he goes to bed every night too, it's about the same thing. Another question is: How big of a deal is this for selling a house? I bought the house with this "pre-existing condition" several years ago. Is there a quick fix I could do to sell the house? We want to move anyway, so an expensive project would not have a ROI for us anytime soon. The detached garage I'm speaking of is an extra garage behind the house. It's more of a shop / shed for my use. It's about 20' x 20', so it's no small thing I want rotting away or listing into the ground. *Los Angeles because I lived there once and still remember the wet seasons, how much water can come down, and houses sliding down onto the Pacific Coast Highway. Unfortunately, the water is not metered in my area (despite living in the desert). He can use as much as he wants without paying more than the flat rate. I think this is partially what is allowing him to not care. I would put in a rain garden designed to be big enough to hold the water. I hope you have enough room to do that. I have two neighbors down the street who drain their sump pumps into street. Their water winds up in my yard. There is no way to fix that problem with grading; the best I could do is put in a swale, but it still causes significant problems. What they're doing is illegal now, but they are grandfathered in. Some people just don't give a damn, and you might as well save yourself some stress and just fix it yourself if you can. The cut is one inch wide, however underneath the cut is usually gravel and a perforated pvc pipe that takes the water away to a holding spot where a sump pump takes the water and expels it into sewer or drainage system. ^^ Some landscapers only do drainage, structural work like retaining walls, etc., no plants. I had a good one dig out my front garden, put in two retaining walls and flagstone walkway, and under the walkway a french drain to the street. This is not the lawncare type of landscaper. Mine had a minimum of about $2500 before they'd take a job, but I ended up spending much more. It was worth it, I was very happy to get the drainage going the right way. Several different experts can fix the problem. Plumbers, landscapers, foundation experts, etc. You might look for drainage experts on Angie's list homeadvisor or other ratings services. In many cases, lawyers can help figure out who is in the wrong, but in this case I agree you probably don't want a lawyer. When it comes to drainage issues, you probably don't want to stick to the letter of the law and, without knowledge of your local laws, it's just as likely that your neighbor is right (though he could be much more polite about it). It sounds like your patio and garage placement was poorly designed. I suggest you do what you can to change the usage and design of your property so that drainage does not cause a problem. Unless you are familiar with local law, it probably would not be a good idea to cause excess drainage to another property if that drainage doesn't easily run to a designed drain (e.g. a curb gutter or natural waterway). This! You have a drainage problem and your neighbor is making it show up daily. Even if you fixed your neighbor, your drainage problem will still occur when it rains. This tells you the fixes you propose along the border aren't going to cut it. You can spend hundreds or more on a fancy solution at the border and then your neighbor may decide to pave a driveway where it's being watered now. And when it rains, you still have a problem. 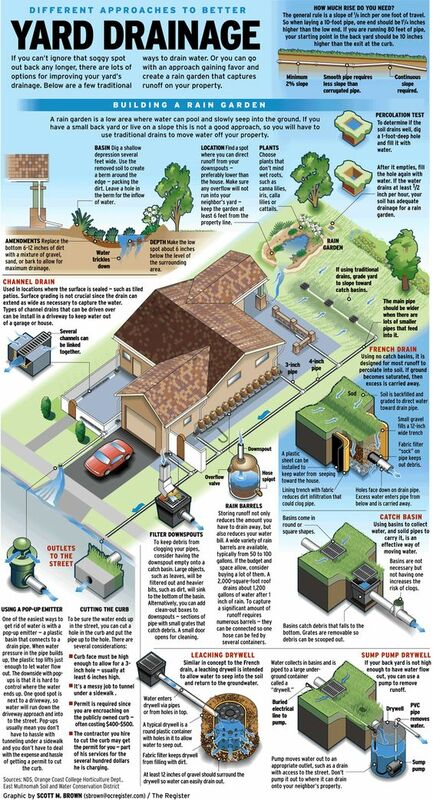 As long as the runoff isn't excessive, consider it free water for your grass and plants. Elemental wrote: the water floods under the fence, across my patio, and leaves an inch or two of standing water on my patio up against my detached garage. You seem to have a pool underground. Water is probably seeping in between the cracks as well as coming up from below. Gutters isn't going to do it and neither is blocking off the fence. Water is going to reach the pool underground and that's the part you have to fix. I like the French Drain suggestions. See if you can tunnel it without having to remove the concrete. Or if you're going to fix the cracked concrete anyway, dig down low enough to take care of the deep problem. I wonder if you can find the bottom of the pool or the most accessible point outside the concrete and can put some sort of pump (like sump pump drywell). Been there done that. A hotel next to a commercial building of ours was draining their pool onto our property. Ran pipes and everything, brazen as could be about it. Your best bet though is to get the city involved first, though. It might make for a tense relationship, but if you're not the one that created the issue in the first place, that's not your fault. If it were a larger scale issue, it'd be up to the DNR to intercede. Other than that, give him a taste of his own medicine: berm your property at the fence and let it stagnate on his side of the fence. You're not redirecting the water flow at that point, just giving it "pause." You need to have a French drain installed. Fixed. rustymutt wrote: You need to have a French drain installed. Fixed. The "French drain" should be installed along the fence line? Here's a link to a website describing proper applications of a French Drain. The illustrations should give an idea of whether this fits your situation. Not necessarily. Water flows downhill. You need to look (or have a landscaper look) at your terrain to assess where the majority of the water is coming from, going to, and where it needs to be directed. A French drain may or may not be the best solution. We installed a French drain a few years ago and it has solved a long-standing problem for us. +1 The drain should correct your issue. If it truly is against code, sounds like HE should be the one installing the drain on his side of the property line, to prevent drainage onto your property. I don't know why you would voluntarily shell out money to fix his problem. Hard to believe that a sprinkler system can come close to replicating a decent rain. There really shouldn't be very much "run-off". This makes me wonder if there is a defective sprinkler head or other leak that is putting way more water than intended into the lawn. ( I had this problem with my sprinkler system and didn't realize it til a neighbor pointed it out. I water at night and by the time I'd ever be walking in the lawn, it would be dried out.) If that is the case, it might be tricky finding a nice way to point it out, or even discover it. Elemental wrote: Unfortunately, the water is not metered in my area (despite living in the desert). He can use as much as he wants without paying more than the flat rate. I think this is partially what is allowing him to not care. It seems to me that flat rate meter is not exactly sound policy for a raft of reasons, both economic and environmental. Perhaps you could lobby the town you live in to change this policy. I remember my father doing something similar and successfully getting the town he lived in to change the rate structure. Environmental groups like say Clean Water Action may also be a useful ally in this. Do you even have a water meter? How about at least 3 photos of the situation? I still have to think that even with just rain alone (not thinking of sprinklers), it's still his property that is draining enough water onto my property causing a problem. I get that I might not have the best drainage, but the problem is because of the neighboring property, and the fact that it's a daily occurrence. I'm in the desert with not much rain, and light, dry snow in the Winter. livesoft wrote: How about at least 3 photos of the situation? Thanks for your interest in helping out. I'll grab a photo tonight, and then a couple more tomorrow after the next wave. My neighbor's yard behind my property is about 10-15 feet below mine, although I've never seen any of my water go into his property it will be inevitable in a heavy rain. He sent a city inspector to my house complaining about the water the very first week we moved in. He never spoke to me about it... not sure if he had mentioned it to the previous owners but I was pissed that he sent the inspector to my property as soon as we moved in and decided to never do anything about it .. The inspector smiled and said he doesn't see any issues on my end. Your case is different complaining to the city/town inspector may help you resolve it with the guy. Code compliance isn't always a solution. My parents had a similar issue and they were told they should have built higher. Their house was there years before the neighbors built. This is what I was wondering. I see "Code Enforcement" vehicles driving around all the time. I looked at the pictures. I think it's your problem, not his. My neighbors' yards drain into mine every time it rains, because my property is lower than theirs. I don't expect them to do anything at all. Dealing with the water is my problem. Your neighbor may be overwatering, but it is a free country. Chip wrote: I looked at the pictures. I think it's your problem, not his. Two neighbors' yards drain into mine. Mine drains into a third. I deal with what drains into mine. The third neighbor deals with what drains into his. Oh, well, then tell the neighbor he is a chuckle head who is wasting his money. Problem solved. I looked at your pictures and it appears your concrete drive is sloped toward your garage. If this is in fact the case, you were bound to have water problems regardless of what your neighbor does. I just looked at the pictures and you clearly have multiple causes, and your neighbor's over-watering is the least of them. - I do not think you are justified in throwing "code" at your neighbor as the only approach to a solution. - Looks like original contractor did a lousy job planning drainage to begin with. From looks of it, their should have been a ditch or other drainage mechanism between your two lots (and others) from day one. - Also looks like the pouring of all that concrete on your property without proper drainage exacerbated the problem. Personally, I would get some consultants in to give you estimates on how to fix the issue from your side. This might consist of french drains, or cutting concrete and putting in drain channels, or other solutions as others have mentioned. I had grading issues with a backyard neighbor in my previous house. A wise man told me that throwing dirt at water drainage problems will usually fix it. If you build up the height at your side of the fence (probably with concrete, looking at the picture), you won't have a water problem. Agree with the other posts. This is your problem, not the neighbors.